Morag’s mantra is “make happy those who are near and those who are far will come”. 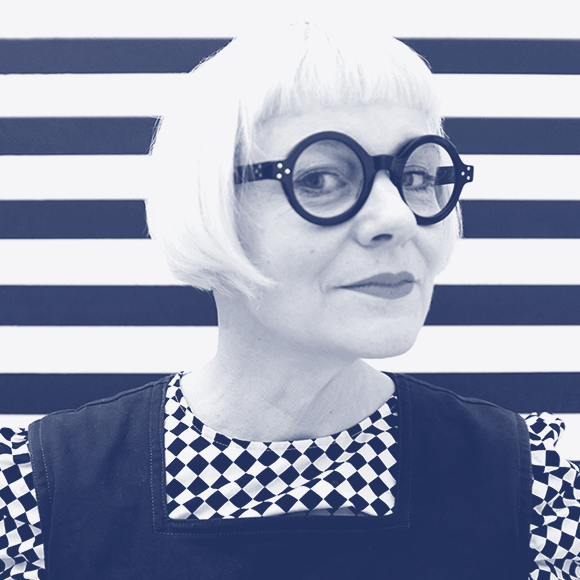 Born and Bred, London, Morag has always lived in the city and has been fascinated by how colour, pattern and words can change urban environments and peoples perceptions of spaces into places. From schools and hospitals to cultural hubs and town centres Morag transforms public spaces by creating engaging experiences for everyone. The Temple of Agape built for the Festival of Love on London’s Southbank in 2014 used public space to create an open, interactive symbol of devotion to love in all its forms. She often works with community groups to develop ideas that reflect the identity of the users, drawing on shared cultural history and heritage of the local area. Morag’s visual vocabulary is inclusive by nature and its effortless energy, resonates both visually and emotionally with audiences well beyond geographical and cultural boundaries. Morag’s contribution to educational environments was recognised in 2015, when her work with Allford Hall Monaghan Morris on Burntwood School won the Stirling Prize for Architecture. Morag is obsessed with “Belonging” and talks around the world about it. Morag’s work has been widely published around the world for her social approach to project and her distinct use of colour and pattern often incorporating positive messaging.